Our refreshingly innovative approach to enhance skin health allows the creation of new products that support multifunctional benefits, while effectively delivering the immediate results demanded by today’s consumer. 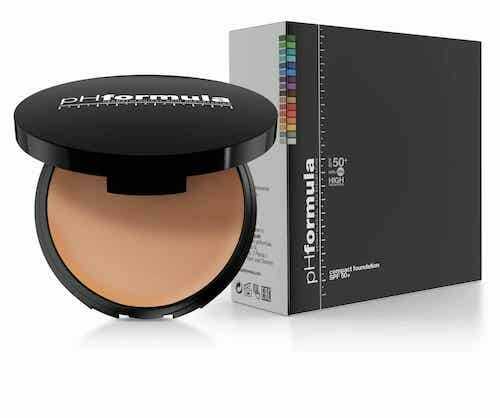 The pHformula compact foundation SPF 50+ provides powerful protection and natural coverage. 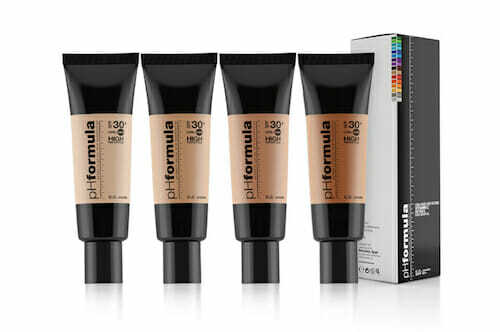 This long-wearing formula provides a broad-spectrum UVA/UVB protection, easy to blend without feeling heavy or greasy. Apply with applicator to a clean, moisturized skin, starting from center of face and blending outwards. 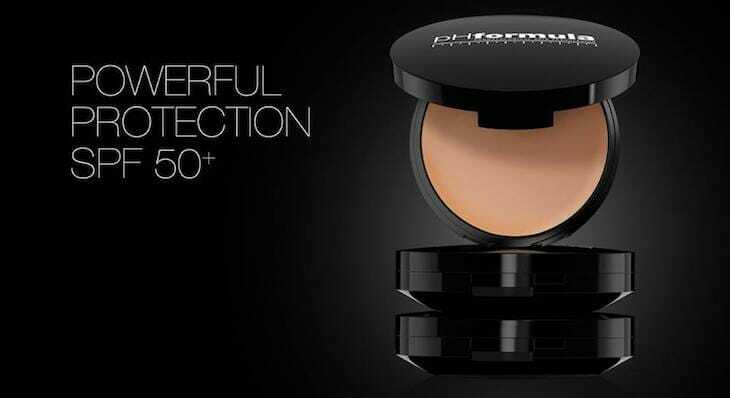 The texture provides full coverage and allows for touch-ups during the day. UVB AND UVA FILTERS – Essential for daily broad-spectrum protection. CARTHAMUS TINCTORIUS SEED OIL – Known as a rich source of natural Omega-6 with superior anti-oxidant, brightening, antimicrobial and healing properties. It helps defend the skin against free radical damage caused by environmental aggressors (such as UV rays). VITAMIN E – Protects the skin from environmental pollution and has a protecting action against UV radiation. It is an excellent moisturizer with powerful anti-inflammatory and wound healing properties. Instantly minimizes the look of imperfections while the sun filters block ageing-accelerating UVA-UVB rays. An ideal cream for day-long confidence with a lightweight, non-oily, comfortable texture. Within moments, skin appears flawless and glows with a natural beauty and the complexion is visibly even-toned, fresh and radiant. SPF 30 PA+++ with UVA / UVB mineral filter protection which helps maintain skin’s hydration level by retaining moisture in skin. Available in 4 natural looking shades: light, medium, dark and newly available; dark plus. UVA AND UVB FILTERS – For daily broad-spectrum protection. VITAMIN C – Effective in treating photo-aged skin with advanced rejuvenation properties adding powerful photo protection to the skin. RETINOL – Regulates cellular differentiation. Stimulates the synthesis of collagen and elastin and acts as a powerful antioxidant. RICE BRAN OIL – Increases elasticity of the skin and keeps it hydrated and soft. It is also used as an anti-ageing ingredient. Apply with fingertips to a clean, moisturised skin and smooth outwards to blend in. The texture provides good coverage and allows for touch-ups during the day. A medicated balm with multitasking ingredients that are most effective at providing instant healing and optimal comfort for dry, chapped and sore lips. Apply to lips as often daily as needed to restore, protect or maintain healthy skin. SHEA BUTTER – Composed mainly of oleic and stearic acids and has rich emollient benefits that helps to maintain moisture in the skin. Recent studies revealed that shea butter manifests anti-inflammatory activity as well. BISABOLOL- Obtained from chamomile by distilling the oil from its flowers. Its superior healing properties make this ingredient ideal to treat delicate lips. SALICYLIC ACID – Soft exfoliating and anti-microbial properties. 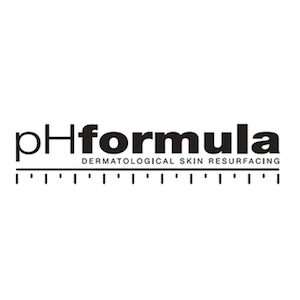 RETINYL PALMITATE – The palmitate form of vitamin A is an essential skin nutrient necessary for healthy skin maintenance and repair. VITAMIN E – it is an excellent moisturizer with powerful anti-inflammatory and wound healing properties. MENTHOL – An organic compound derived from mint which provides a refreshing action soothes itchiness, redness and sunburn. 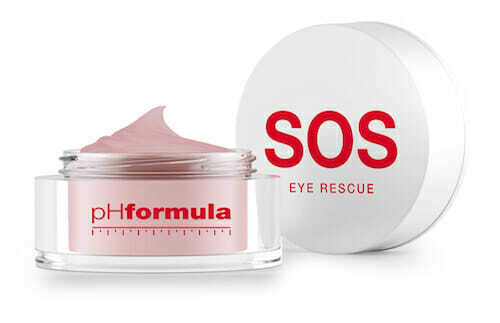 The SOS eye rescue contains a unique peptide complex which assists in reducing the appearance of fine lines and wrinkles as well puffiness and dark circles. The weightless cream texture rich in skin-identical ceramides help to improve skin elasticity and hydration. A light-reflecting formula glides across the lid and instantly brightens the skin around the eye contour. Ideal to prep the eyes for a smoother and longer lasting eyeshadow application. Apply once or twice daily around the eye area including the upper eyelid. Gently pat in an upward direction around the orbital bone and eyebrow bone. PEPTIDE COMPLEX – A powerful combination of two peptides namely, Palmitoyl tripeptide-1 and Palmitoyl Tetrapeptide-7 work synergistically and act as a cell messenger to stimulate the wound healing process, which includes collagen synthesis of collagen I, fibronectin and hyaluronic acid. The peptide complex provides a smoothing effect on expression lines and dismisses eye-puffiness and dark circles, erasing any sign of tiredness. SKIN IDENTICAL CERAMIDES – Provides superior skin protection by assisting to restore the compromised lipid barrier function, preventing and improving dehydration. CHRYSINIMIDE – A combination of active ingredients able to absorb and eliminate colored blood pigments in the skin which are responsible for dark circles under the eyes. It also has an anti-inflammatory effect and reinforces firmness and tone of the eye area. VITAMIN E – It is an important lipid-soluble antioxidant which protects cell membranes from oxidation. With excellent moisturizer, powerful anti-inflammatory and wound healing properties.